I had quite high expectations of this album, because it is by the daughter of renowned singer Tony Bennett. Mind you, that can have its problems as children of famous parents often get preferential treatment - it’s called nepotism. Yet Tony Bennett says of his daughter: “Antonia’s got the gift. She has good time. She sings in tune. She has a good spontaneous feeling for phrasing”. In fact Tony’s assessment is a fair summary of Antonia’s gifts, although I’m not too sure about her phrasing. In fact her sound and style remind me of Stacey Kent, who has the same shake in her voice, and a similar pleasing tunefulness - despite this sometimes falling into blandness. Antonia sings in tune but her enunciation is poor, leaving off some final consonants which ought to be heard to get the thrust of the lyrics. The lyrics are another point of contention. In an interview, Antonia praised the lyrics of the Great American Songbook, which makes up the entirety of the material on this CD. But if she so admires the words of the songs, why does she often change them unnecessarily? She garbles the lyrics ofI Can’t Give You Anything But Love, changing “That's the only thing I've plenty of” to “That’s the only thing I’m dreaming of”. In Nice Work if You Can Get It, she omits “anything” from “anything more”. And in The Nearness of You, she adds the word “Darling” before “if you’ll grant me”, similarly upsetting the balance of the words. The backing trio is generally very acceptable, although the pianist has a way of ending tunes with upward tinkling notes that sound attractive the first time he uses them but which become irritating when used too frequently. And the drummer is one of those people who plays random rimshot clicks which add nothing to the rhythm. To cap it all, the album lasts for only about 35 minutes – not exactly generous. There are hosts of lady vocalists around at present, and listening to Antonia gives me the same feeling as watching The X Factor on television: do we really need more singers? Though he has recorded in many different contexts before, from duets to trios to big bands, Michel Camilo has released only one solo piano outing in his long career up to now, 2005's Solo, which revealed in intimate detail his tactile, technical facility. What's Up? is a few steps down the road. Comprised of seven originals and four covers, this date showcases the composer and pianist's love of harmony, texture, color, and rhythmic invention in performing solo jazz piano. Camilo is a wily and rangy player; he embraces the jazz piano tradition throughout this date, and extends it with Latin and classical music He opens with boogie and stride in the title cut; it's punchy, knotty, joyous, and swinging -- a fine ride through Camilo's blues imagination. Following this energetic opener is the moodier "A Place in Time," with its classical nocturne feel that explores varied hues and timbres inside a minor-key arrangement. Given its ethereality and shimmering nuance, it's a fine contrast to the opener. Camilo's love of rhythms is evident in his sprightly reading of Paul Desmond's "Take Five" and his own charging Latin powerhouse "Paprika," with its wide harmonic exploration in the right-hand chord voicings and his rumbling left hand that shifts accents every chorus. His version of "Love for Sale" is playful, elegant, and canny in its deep inquiry into the melody's possibilities for extrapolation -- his solo winds it out entirely without losing its essence. His reading of Compay Segundo's "Chan Chan" is rife with Afro-Cuban rhythmic accents even as it exposes both blues and son. "On Fire" is an exercise in pure technical mastery yet despite its intense right-hand arpeggios and ostinatos, its intricate lyric statement remains amid athletic rhumba, mambo, and salsa rhythms. In his closing ballad "At Dawn," one can hear traces of both Bill Evans and Keith Jarrett, as space, and lyricism -- both direct and implied -- send the recording off with an elegant whisper. What's Up? is a commanding performance by a truly masterful, wildly creative jazz pianist and composer. Three excellent musicians in his best moment. The music is clear and beautifully, full of elegance . Acoustic sound with some electric touchs , simple but also majestic but in essential acoustic. Perez is a excellent pianist, Patitucci is a great bass player and Blade is one of the best drummer in this moment. All the CD is impregnate of some kind of special light, the light of his mentor Wayne Shorter is present in every note. Great trio album, a complete lesson of how make something simple and in the same time some deep a full of beauty. De 1997 a 2000, Rosa Passos lançou quatro álbuns pela Lumiar Discos, gravadora do violonista e produtor musical carioca Almir Chediak (1950 - 2003). Três foram songbooks dedicados pela cantora baiana às obras dos compositores Ary Barroso (1903 - 1964), Antonio Carlos Jobim (1927 - 1994) e Dorival Caymmi (1914 - 2008). Lançada pela gravadora Biscoito Fino neste mês de agosto de 2015, a coletânea Rosa Passos canta Ary, Tom e Caymmi compila 13 fonogramas destes álbuns. De Letra & Música - Ary Barroso (Lumiar Discos, 1997), álbum assinado por Rosa com o violonista Lula Galvão, o CD rebobina Morena boca de ouro (Ary Barroso, 1941), Pra machucar meu coração (Ary Barroso, 1943), Camisa Amarela (Ary Barroso, 1939) e Isto aqui o que é? (Ary Barroso, 1942). Do álbum Rosa Passos canta Antonio Carlos Jobim - 40 anos de Bossa Nova (Lumiar Discos, 1998), a coletânea inclui Inútil paisagem (Antonio Carlos Jobim e Aloysio de Oliveira, 1964 - e não Newton Mendonça, como creditado no álbum original em erro reproduzido na coletânea), Garota de Ipanema (Antonio Carlos Jobim e Vinicius de Moraes, 1962), Vivo sonhando (Antonio Carlos Jobim, 1963) e Samba de uma nota só (Antonio Carlos Jobim e Newton Mendonça, 1960). 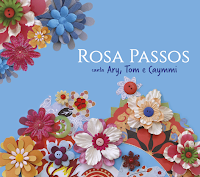 Por fim, do álbum Rosa Passos canta Caymmi (Lumiar Discos), a compilação reapresenta Samba da minha terra (Dorival Caymmi, 1940), Vestido de bolero (Dorival Caymmi, 1944), Marina (Dorival Caymmi, 1947), Só louco (Dorival Caymmi, 1955) e Vatapá (Dorival Caymmi, 1942). Detalhe: os fuxicos que ilustram a capa e o encarte do CD Rosa Passos canta Ary, Tom e Caymmi - em projeto gráfico criado por Flavia Oliveira - foram confeccionados pela própria artista.